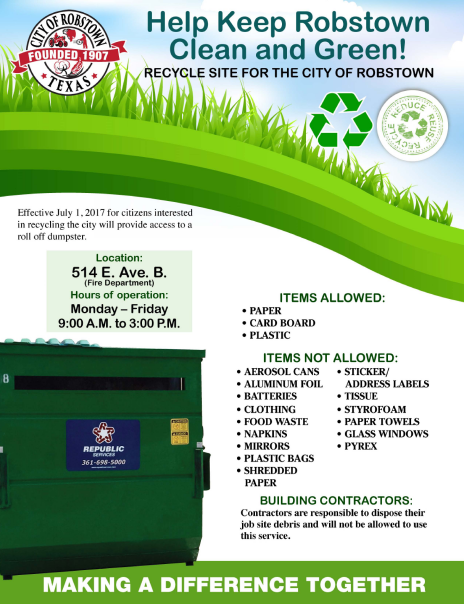 The City of Robstown has begun the process of undertaking several initiatives set forth in an effort to continually beautify the City of Robstown. We undertake these initiatives in hopes of re-igniting the pride in Robstown. We want to keep our streets and city looking beautiful for all to enjoy. Here is a breakdown of the current initiatives being undertaken by the City. 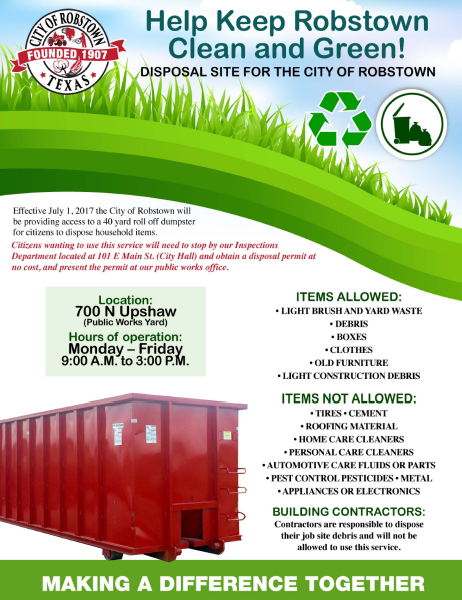 The City of Robstown is offering free collection of bulk waste and brush at the Public Works Department on Upshaw. We are going to start scheduling quarterly curb-side pick up of bulk waste and brush. In a continued effort to beautify the City of Robstown, we ask that you comply with ordinance and not put out any waste curbside unless it’s your scheduled time. for citizens to dispose household items. Department located at 101 E Main St. (City Hall) and obtain a disposal permit at no cost~ and present the permit at our public works office.